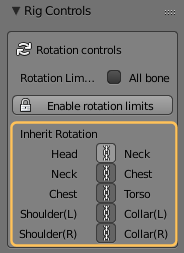 The rotation Controls are part of the Rig Controls Panel. 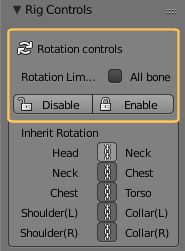 The buttons Disable and Enable apply to the set of selected bones by default. 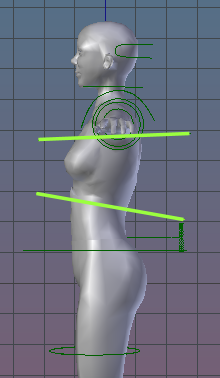 Note: When you have ticked All Bones, then the enable/disable buttons affect all bones. A small example may help to understand what happens: The Head can be decoupled from neck rotations. 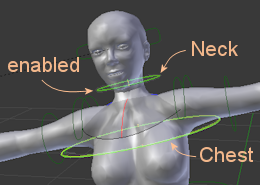 In the default case the rotation is inherited.When you now rotate the Chest, this rotation will be forwarded to the children of the Chest, here to the Neck and collars. Subsequently the inheritance will pass down to the leaf bones, thus the entire upper body follows the rotation. 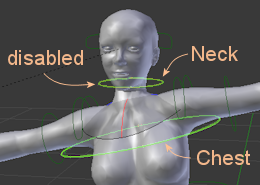 When the rotation inheritance is disabled, the Head keeps in the upward position regardless of the rotation of the Chest. In the same way, keeping the orientation of the chest regardless of the lower body can be useful in some motions. Note: The inherit rotation buttons can be key framed into the animation. The Breath controler allows to add a subtle breath movement which affects the spinal column from the Pelvis up to the Head. 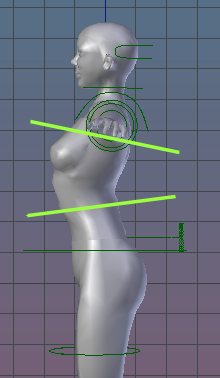 The bone that gets the most influence is the Torso, which gets rotated along the x axis. [break] You can press Breath In/Breath Out multiple times to get a “deeper breath”.